The coalfield extends along the coast from Whitehaven to Maryport, a distance of fourteen miles, and varies in width from four to six miles. From Maryport it continues a further twelve miles to Wigton, but narrows to about two miles in width. In addition a large area of coal has been worked under the sea bed, mostly in the Whitehaven area, with the coal being mined up to four miles out from the coast. The dip of all the above seams is seaward, with a fall of approximately 1 in 2. The Main seam crops out near the line of the low road to St.Bees, and has been worked from a very early period along the outcrop as far as Partis Pit near Stanley Road, Mirehouse. The Bannock seam crops out at a correspondingly higher level. At first the coal was worked from the outcrops where the seam was exposed. One of the earliest records of coal mining in West Cumberland dates to 1560 when Sir Thomas Chaloner, lord of the manor of St Bees,in granting certain leases within the manor, reserved for himself the right to dig for coals while at the same time granting his lessees liberty to take coals from his pits for their own use, on the condition that they paid and laboured from time to time therein, according to the custom of the manor. The Lowther Family came on the scene in the 1600s, in particular Sir John who may truly be described as the founder of the Whitehaven collieries. These were worked by the Lowthers – ably assisted by their agents, the Speddings – till August 1888, when the working pits and a large tract of submarine coal were leased to the Whitehaven Colliery Company. The mines stayed in private hands till the industry was nationalised in 1947. A major development in coal mining took place in West Cumberland in 1650 when, to win new tracts of coal, pits were sunk and drifts cut horizontally from the lower grounds to drain the workings. This arrangement was called the pit and adit system. The coal was originally raised by jackrolls and later by horse gins. In 1663 Sir John Lowther drove a long level from Pow Beck in a westerly direction under Monkwray and into the Bannock Seam. This level drained an area sufficient to serve the needs of the coal trade until nearly the close of the 17th century. Later, on the 10th November 1715, in order to win coal from deeper levels, Lowther installed the first steam pumping engine in a Cumberland mine at Stone Pit, Howgill near Whitehaven. This Newcomen engine, with a 17 ins cylinder, was hired for £182 per annum. Another great feat took place in 1729 when the Lowthers started sinking Saltom Pit right on the sea shore, just clear of the cliffs. The sinking of this new mine so close to the sea, to work the coal under the sea bed, was quoted as being the most remarkable colliery enterprise of its day. When the pit had been sunk 252 feet a strong blower of gas was pricked, then piped to the pit top where it burned for many years. The agent, Mr Spedding, offered to supply the gas to the town of Whitehaven but the trustees did not take up his offer. Throughout their history the coal mines of West Cumberland, and in particular those in the Whitehaven area, were plagued with firedamp (CH4), and as greated depths were reached the problem of ventilation became critical. Accumulations of gas precipitated explosions which killed or maimed the colliers and seriously damaged the underground workings. To the employer the damage done to the mines was more important than the loss of life. New methods of lighting and ventilation were tried. One of the most important early inventions was the Spedding steel mill, the first attempt to produce a safe means of lighting in an atmosphere containing firedamp. This new device was merely a steel disc fixed to a small cogwheel and geared to a larger wheel. When the handle was turned a piece of flint was held against the disc, creating a stream of sparks which enabled the miners to see to work. The use of the Spedding steel mill spread throughout the north of England, and they were used till the introduction of the Davy lamp in 1819. Wooden props were the main means of supporting coal workings, but at the pit bottoms and main haulage roads and junctions brick walls were built and roofed in timber, second-hand steel and old tramlines. 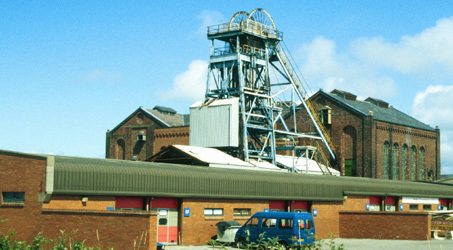 The timbers used in the Whitehaven mines of 1750 were imported from Norway by Sir James Lowther. Some of them are still supporting the old workings. According to the Victoria County History the first record of an early attempt to prove coal in East Cumberland is in the books of the Newcastle Corporation, wherein it is stated that in 1552 coal was bored for in Greenside Rigg in the parish of Farlam. The major area of mining activity appears to have been Tindale Fell where there were many pits. In 1801 Tarnhouse and Talkin Collieries produced 197,015 loads of coal, rising to 278,615 loads in 1810. From early times coal had been worked at other places from the carboniferous limestone series along the Pennine range, but apparently it was mainly used for lime burning. The most importantarea of such mining was said to have been at Croglin. When the manor of Croglin was purchased by Charles, Duke of Somerset, in 1738, it included a colliery which was in continuous operation till 1864. There were also early coal workings at Hartside and Renwick in the Crossfell range, the earliest reference being in the account book of Lady Anne Clifford for 1665. In 1905 these firms were the only producers of coal at Alston, and did not employ more than 40 persons underground altogether. The three firms were all working the little limestone coal, which in the Alston district is found in two distinct seams twenty feet apart, the upper being about 20 inches thick and the lower 12 inches thick. Coals has also been worked on a small scale in the Caldbeck, Shap and Stainmoor areas. At Caldbeck the little limestone coal crops out on the southern flanks of Warnfell Fell, and numerous shafts indicate that the seam has been extensively worked. Its thickness is said to vary between 1 foot and 2.5 feet. A lot of this coal would have been used for lime burning. At Borrowdale, Stainmoor, it was worked at many localities in the lower carboniferous series, and in the westphalian Argill coalfield. Here coal was worked by adits on the north bank of Argill Beck, where it is said to have been nearly four feet thick. A trial pit was sunk in 1946 and two feet of coal, overlain by siltstone, was proved. The last small working in this area was an adit, now collapsed, where coal up to seven feet thick was said to have been worked. Mining ceased in 1946. A report on the Oxford Archaeology website about Saltom Pit at Whitehaven. Follow the path Explore/Focus On/Industrial Archaeology/Coal to reach it.